Everyone knows the Cedar Point tradition by now: the tallest, the fastest, the face-distorting, gut-wrestling, year after year. But when those rides grew to 420-foot heights and 120-mile-per-hour speeds in 2003, some fans noted that there was something missing from the latest Cedar Point creation, Top Thrill Dragster. It may have had the Guinness claim to fame, but other than that, it was a one-trick pony: blast-off, climb, dive, finish line. Not the same substance that madeMillennium Force one of the world's favorite rides back in 2000. Flash ahead two-and-a-half years to October 30, 2005 when Cedar Point bid its final goodbyes to one of three water rides, 1982's big new flume White Water Landing. It was only too obvious that the park was breaking all records yet again. We'd seen the mega-coaster, the giga-coaster, and the tera-coaster; now, we would finally get to see a "peta-coaster" in action. No, not a coaster sponsored by People for the Ethical Treatment of Animals or even People Eating Tasty Animals, but the first ride to rise above the uncharted 500-foot heights. Now how exactly would it fit in five and a half acres? The world would wait and see. But then, there were doubts. Perhaps it would be a new water ride of some sort. After all, the park had planned on installing one in 2005 before deciding on MaXairinstead. When light brown supports and red, boxy track began stacking up mysteriously in Sandusky, Ohio in 2006, it evoked memories from seven years past when Millennium Forcewas about to become the new kid to dominate the block, of five years past when Wicked Twister began stacking up, and of four years past when Top Thrill Dragster began rolling into town. In fact, it called forth such strong memories of the latter with its similar color scheme that far-fetched rumors began circulating that these track sections would simply extend Top Thrill Dragster's layout to cover half the park. However, as supports began going into place, the coaster world began coming to a certain realization: this would be something special. It became obvious that this was no 500-footer, and if Cedar Point was breaking the time-honored tradition, they'd better have a darn good reason. Indeed, a darn good reason will be blowing in to town for the 2007 season. Maverick is the name of the newest member in the Cedar Point family, and with good reason. This is as much of a rebel from tradition as Cedar Point has seen in some time: a ride purely designed for its uniqueness as opposed to statistics. In terms of expense, Cedar Point spent some twenty-one million to bring about a 4,450-foot ride. That's only four million less than the giants Millennium Force and Top Thrill Dragster. From the first hill to the layout's finale, Maverick[/i] proves no ordinary roller coaster, although it may use conventional track and trains. For one thing, this isn't powered by the normal lift hill; the designers at Intamin AG decided to go with a Linear Syncronist Motor system like that of California Screamin' at Disney's California Adventure to power the initial lift hill at speeds much faster than your traditional lift. From there,Maverick really shows off with a first drop not only vertical, butbeyond vertical as several other rides have done in recent years. At a ninety-five-degree angle, riders plunge into ostensible oblivion before pulling out into a sharp, yet smooth curve at the bottom into the layout's pure twister madness. Unlike previous rides, the park wanted this coaster to feature terrain interaction and ground-hugging elements, and the designers delivered, with a quick sequence of banked turns twisting through themed canyons. And that's only the first half of the ride. 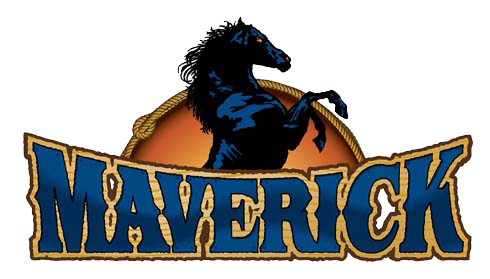 It should also be noted that Maverick will become the first coaster at Cedar Point in over a decade to incorporate inversions into the experience, with a pair of flat spins. During the initial half of the layout, riders will flip through a flat spin, turnaround, and second flat spin in an arrangement Cedar Point has named a "twisted horseshoe roll." But it only gets even more insane from there when riders pass underneath the station and enter a 400-foot tunnel where those LSMs are used again to their full potential, blasting the train off at seventy miles an hour to complete a second half of the enormous layout complete with a sweeping turn over a pond and cross-under with the first drop. And that isn't even the grand finale. the end of the hill, the train dives under wooden beams helping to theme another ground-hugging bank with a canyon wall to the left side. Now, it's time to go upside-down. Passengers find themselves upside down over water as they flip through the first of the flat spins, then make a U-turn around a water fountain. Then it's up, up, and flipping to the left through the second flat spin. Twisting over the top, inverted again, then diving down the other side, the inversion transitions into a right-hand turnaround beside the midway and then the train hops slightly and flies into darkness underneath the station. Without coming to a complete stop, the LSMs pour the speed on and the train blasts forward in the darkness at seventy miles an hour, completing the four-hundred-foot tunnel in no time and then hitting a heavy banked curve to the left. The train emerges and completes the curve, then the track begins climbing with the further aid of LSM propulsion. Over the top, the red rails begin diving and curving to the right towards the midway, water splashing around below. At the base of the dive, Maverick serves up one of the ride's most anticipated feats: a heartline roll, taken at breakneck speeds, just feet off the ground. More canyon walls fly past in all directions as riders find themselves weaving from the right to the left in the banked S-curve. With a left bend, the track climbs to aim straight at the first hill. With a slight curve and heavy banking, the track weaves through the first drop's supports and dives sharply over the tunnel's roof. Now, it's time for the grand finale. Crossing over the first curve, the coaster bands to the right in a 135-degree turn setting itself up to cross over the first canyon segment of the ride. With a quick transition, riders go from leaning on their right to leaning on their left while the track banks to a ridiculous ninety-two degrees, beyond sideways, and curves forty-five degrees while plunging in a quick drop. At the bottom, the ride pulls out in a trench, then climbs over another airtime-inducing hop. With one more heavily-banked curve to the right, Maverick climbs onto the brake run. Magnetic brakes bring riders gliding to a smooth stop, then rounding a final curve to the right leading to the unloading platform. From there, riders can check out their ride photos or brave the line again for another ride!